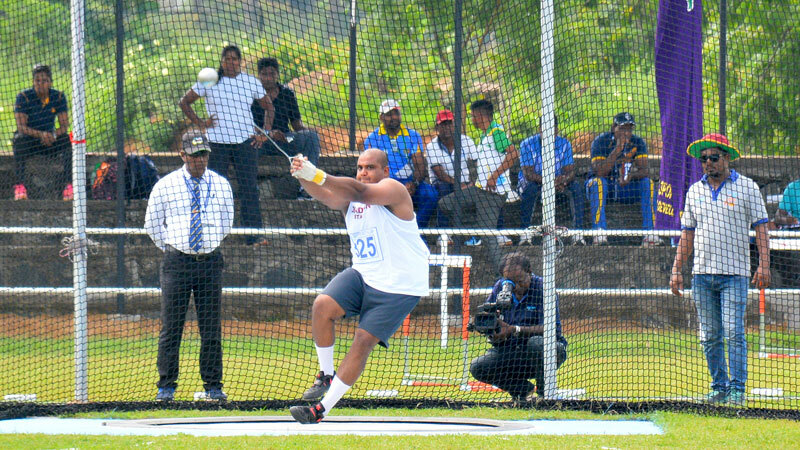 Charith Kapukotuwa of North Western Province set up a new meet record in the Hammer Throw event with a throw of 50.86 metres erasing the previous record of 49.69 metres set up in 2014 in the 44th National Sports Festival at the National Sports Complex in Polonnaruwa yesterday. The Silver medal in the event was bagged by Sisira Kumara of Southern Province with a Throw of 46.97 meters while G. S. R. Kumarasiri of North Central Province (46.84 meters) took the bronze medal. Sri Lanka record holder Manjula Kumara of Southern Province with a leap of 2.21 meters won the high jump event while Anura Pradeep of Southern Province (2.07) metres took the Silver medal R. R. D. Ranathunga (2.07) metres from Sabaragamuwa province bagged the Bronze medal. Tharika Kumudumali of Western Province won the women’s Putt Shot event with a throw of (14.59) metres followed by M. N. D. Muthunayake 12.77 metres of Central Province and Priyangika Kumari of Southern Province (12.38) metres. Central Province dominated the men’s 10,000 metres event winning the first three places Kumar Shanmugeswaram won the gold medal in a time of 30 minutes 49.99 seconds while record holder of the event Lionel Samarajeewa had to be satisfied with the silver medal in a time of 30 minutes 57.95 seconds while the third place went to J. K. Bandara (31.22.95). Sachini Kaushalya of Western Province won the women’s Pole Vault with a leap of 3.20 metres while Central Province’s K. A. C. K. Kodithuwakku and Northern Province’s C. Herina emerged joint second with a leap of 3.00 metres Nilani Ratnayake of Sabaragamuwa Province won the women’s 5000 metres event in a time of 17 minutes 18.70 seconds.